Shopclues Refer and Earn: Shopclues is back again with new awesome offer. you just need to refer your 3 friends to install Shopclues app in their smartphones, after your 3 friends installs shopclues app sucessfully, you will get 100rs Voucher for free. Shopclues is very Famous online Shopping site, which offers you Best deals at Cheapest rates ever. So Let’s go for the offer. You can use this voucher on Shopclues site as 100 off on 100 rs Purchase or more. After Install Shopclues app, Open it & use it for 2 minutes. Goto this link and input your name with email. After you 1 Friends Install Shopclues app with your refer Link, you will get 100rs voucher in your Mail Box. After get 1 code create new account and refer from there and Earn Unlimited. 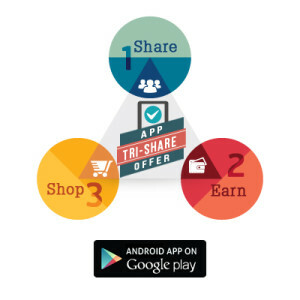 Shop for free using this voucher at shopclues app or site.